In July month of 2015 Moon will appear in its Total Phase (full Moon) for two times. Making the Second Full Moon Visible on 31st July to be referred (from recent years) as Blue Moon. Generally in a Calendar year at least one Full Moon is visible in the sky every month. However sometimes rarely two full moons appear in same month. Hence in the modern western folklore metaphorically to describe the rarity of this occurrence of second full moon (like on 31st July) in a month is popularly referred to as Blue Moon. Dates of Full Moons in July 2015: In July month this year 2015. First Full Moon appeared on 2nd July, 2015. Whereas Second Full Moon will appear on 31st July, 2015. Direction – Time to watch: On 31st July, 2015 one can look towards East Direction to see Moon which will Rise at 6.43 p.m. whereas technically speaking the Moon will however reach its fully illuminated Total phase at 4.13pm itself. Note: Moon Rise time for Delhi is 7.01pm, Dibrugarh (5.46 p.m.), Ahmadabad (7.14pm), 6.36pm (Kanyakumari), Bhopal (6.54 p.m). Across India depending on observers location should look East few minutes after Sunset when Moon is above horizon. When was last time - Blue Moon Event Occurred and when is Next One? 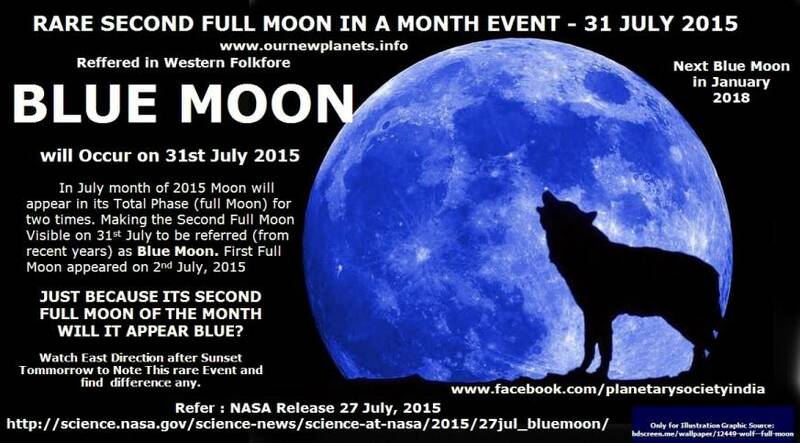 The last time “Blue Moon” event occurred was on 31st of August Month in 2012 (2 August 2012 & 31 August 2012). The next time it will occur is on 31st of January Month in 2018 (2nd Jan 2018 & 31st Jan 2018).